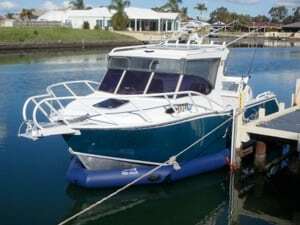 WA is booming and that is keeping us busy supplying FAB Docks to those boaties out West who have very nice boats, but no time to worry about the maintenance that normally goes with leaving their boat in the water. 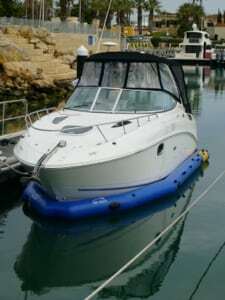 When you are working that hard, you want to play just as hard, so if you have been away for some time, you want to know that your boat is clean and dry and ready to go at a minute’s notice for those spectacular days out to Rotnest Island or fishing on the shelf. A very special thanks to Scott for his invaluable hard work in helping me install his FAB Dock under his brand new Sea Ray. It was cold, wet and windy and pitch black by the time we finished so it is my shout for the beers when I am next out your way. And if you live in the Mandurah area and need a good sparky for any reason, give Kim a call at Accord Electrical. The nicest guy I have met in a long time; a true gentleman. And he loves his marlin fishing and his boat has the scars to prove it. His friend Adrian was the first person in WA to get his FAB Dock installed under his purpose built Razorline. A normal installation takes about 2 or 3 beers, but twenty beers later we were still sitting on his boat. The FAB Dock had long been installed and emptied out but how could you be in a hurry on an afternoon like that. The last one for the Weekend was Chris Box’s own 30 foot Concept with twin 300 HP Verados. 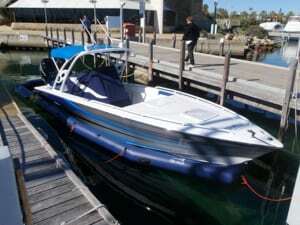 If you need to get to Rotto in a hurry then that is the boat you need. Ten minutes from Freo is one quick trip. If you want to check out these boats, or even the bigger 45 footer, then give Chris a call at Martin Box Marine. We measured up a number of other boats while we were out there so we are looking forward to our next trip out West. The hospitality is amazing.